If you are planning a road trip with kids, games will keep kids entertained and help pass the miles of your road trip. There are many road trip games for kids. 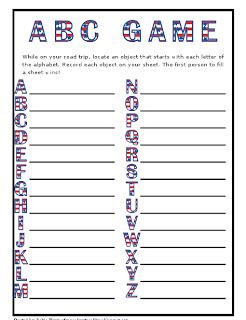 Some of my favorite road trip games like The ABC game, I spy, and the liscense plate game, also sneak in some learning. The ABC game is a pretty classic road trip game. Beginning at the first letter of the alphabet, all participants in the car look for an object beginning with the letter "A". Once an object is found to represent "A", the game moves to "B".Often this game is played orally until riders start to check out or nod off. Honestly, the game starts off fun, but does anyone ever make it to letter "z"? We always gave up on the ABC game before we made it to the end. I thought it would be fun to spruce up this game with a printable recording sheet for this road trip game. You can print out this sheet with each letter and take it on your road trip. When you begin to get bored with the game, put the sheet away for a while. This way you can keep coming back to this game, and keep it interesting. Road Trip Game 2- "I Spy"
We would check off each item as we found it. For some reason, kids find this to be a highly entertaining game. This same road trip game can be used with concepts such as colors, numbers, letters, words, or even shapes. Here are a few free printable road trip games for "I spy". A third fun road trip game for kids is "the liscense plate game". Simply get a sheet of paper and begin listing each liscense plate you see. Can you find all 50 states? This is great for geography. Your child can learn the names of the states. He may also wonder why he is seeing so many of a given state. He may be able to generalize which states are close and which may be far away by looking at his list. This road trip game also will give your child a chance to practice reading as she reads the liscense plates, and recording as she records them. Summer road trips with kids don't have to be boring or annoying. A few simple games can keep the road trip fun. Use your time on the road to create some lasting memories and build your child's brain power at the same time! Do you have any fun road trip games? I played the license plate game as a kid! And when I was small enough that my family lived in farm country, we had a points-based game where you got a certain number of points for a cow, horse, tractor, etc. Great math practice! Thanks for the printable! I love the idea of being able to put it away and take it out again! I love road trip games. Sure, those in-car dvd players keep kids quiet, but road trip games are such a fun way to sneak something educational into the trip. And I think they are something kids will remember long after a movie has faded from their minds. We make our yearly 13 hr pilgrimage to the beach so we play many road trip games. One game the children really like is the Category Game. We pick a category like animals or food and then we go around and around taking turns, following the alphabet. A = ant eater, B = baboon, C = cat . . . Daddy likes to come up with crazy answers that make the kiddos giggle! Great activities. I remember playing the license plate game. I love to take books on tape/cd in the car. It works well for those who get car sick reading in the car. I loved playing games in the car when my kids were little - they are all grown up now! We tried a spelling game at times, but I had to concentrate on it so hard that I was scared I wasn't focusing on driving so we gave that one up! Great post! Glad I found your blog!